When the weather is hot and you want a sweet treat, it’s nice to have some no-bake dessert ideas. And while healthy treats to help you keep cool are best, sometimes you just want something a little more, well, decadent. 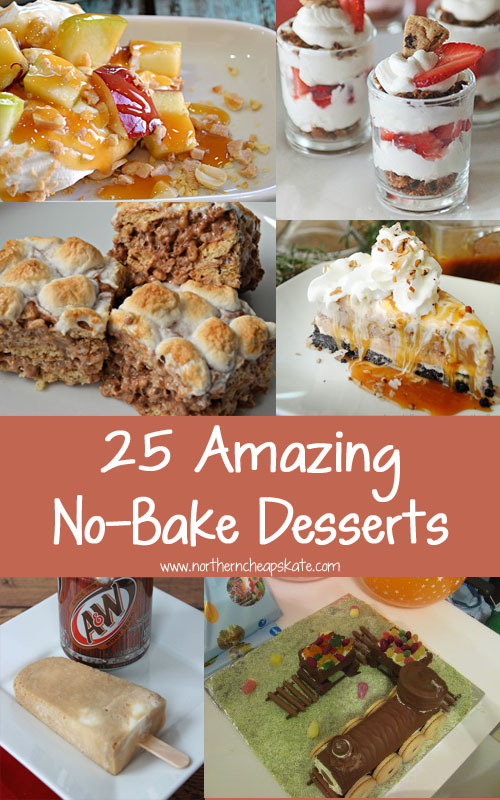 Check out this collection of 25 amazing no-bake dessert recipes that are perfect for hot evenings, busy days and potluck gatherings! Caramel Apple Pudding Dessert from Lady Behind the Curtain. No Bake Chocolate Covered Peanut Butter Balls from Baking & Browning. I love that this recipe is easily adapated for those of us with peanut allergies! Easy 3-Ingredient Chocolate Mint Bark – No Bake Dessert from A Day In Our Shoes. No-Bake Chocolate Eclair Dessert from The Kitchen Is My Playground. No-Bake Chocolate Chip Cookie Pie from The Kitchen Is My Playground. This recipe is made with Chips Ahoy! cookies! Easy and Delicious Baked Apples from the Microwave from Thrifty Jinxy. Perfect for summer or for winter nights when you want a quick sweet treat! S’mores Rice Krispy Treats from Thrifty Jinxy. Banana English Toffee Cream Dessert from Hot Eats and Cool Reads. Berries with Marscapone Cream from Hot Eats and Cool Reads. A little patriotic summer dessert using fruit in season! Homemade Nanaimo Bars from Framed Frosting. Creme de Menthe Chocolate Truffles from Framed Frosting. No Bake Banana Cream Chocolate Eclair from Saving Cents With Sense. No Bake Peanut Butter Cereal Treats from Saving Cents With Sense. No Bake Chocolate Oatmeal Cookies from Ann’s Entitled Life. Biscoff Cheesecake Shooters from I Want Crazy. Layered Turtle Ice Cream Pie from I Should Be Mopping the Floor. Lemonade Ice Box Pie from I Should Be Mopping the Floor. No baking and only four ingredients! Chocolate Chip Cookie and Strawberry Trifle from Frugal Living Mom. Easy No-Bake Cookies from Savings Lifestyle. Classic, delicious and most importantly, EASY. No-Bake Milky Way Cheesecake In a Jar from Savings Lifestyle. Light & Fluffy Peanut Butter Pie from Some of This and That. No Bake Train Cake from In the Playroom. This is an adorable, fun project that won’t heat up your house! Root Beer Float Popsicle from Eating on a Dime. Only two ingredients! Easy Strawberry Shortcake Trifle from A Mom’s Take. Easy Peanut Butter Dark Chocolate Balls from Mommy Octopus. And of course, if your favorite no-bake dessert is ice cream, you’re like me! Keep your ice cream from getting crystals with one simple trick. Thank you for including my train cake! I’ll go check out the others. I love no bake stuff, its just so easy and convenient! Thank you so much for featuring my Homemade Nanaimo Bars!